The album is available on all digital platforms worldwide via 21ST Hapilos Digital Distribution. 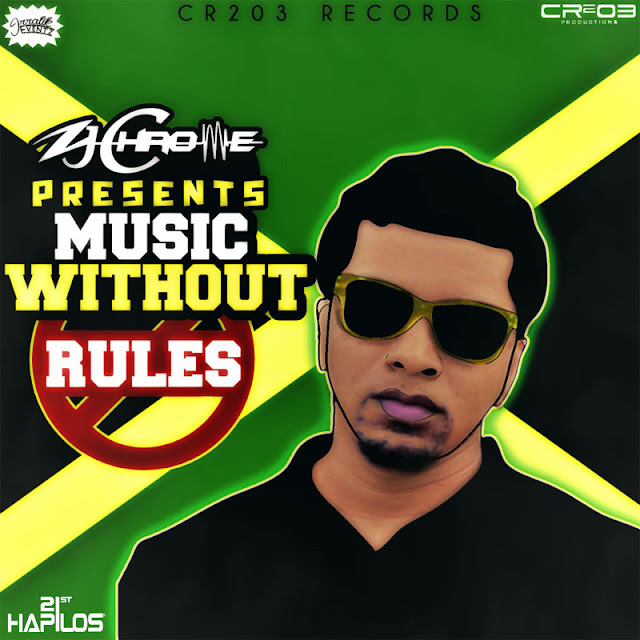 MUSIC WITHOUT RULES sees Chrome teaming up with Jamaica’s top Reggae and Dancehall acts. Chrome has taken time to create a solid 14-track album, as MWR has been a work in progress since 2013. The release of MUSIC WITHOUT RULES makes Chrome the first Jamaican DJ/Producer to release a complete studio album. The first single from MWR sees Chrome collaborating with one of the leading acts in Jamaican Dancehall Vybz Kartel. The single titled “STOP FOLLOW ME UP” and its music video have been released simultaneously with the album. Martin, Popcaan, Demarco, G Whizz and Luec Mar. Speaking about MUSIC WITHOUT RULES Zj Chrome said, “This is a body of hard work that I am proud of and this album is definitely worth listening”. CR203 RECORDS has over the years consistently released hits including “ Clarks” – Vybz Kartel, “Cheaters Prayer”- Chris Martin, “Before I Leave”– Jah Cure, “Hope and Pray” – Mavado, “Jook So” Aidonia, the Smokin Riddim, “ Weh Yu Did Deh”- Alkaline, “Karma” – Tarrus Riley and many more. Stay tuned for the next releases from CR203 Records “Let’s Rock This” along with a Reggae Riddim.